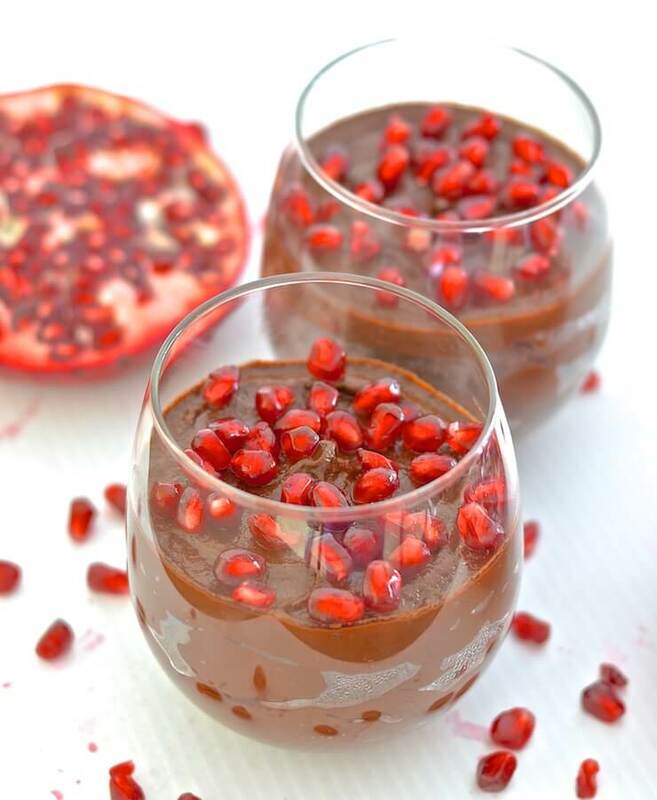 Velvety smooth, intensely rich Vegan Chocolate Pudding. It’s super fast & easy to make & hides a very healthy secret…….. 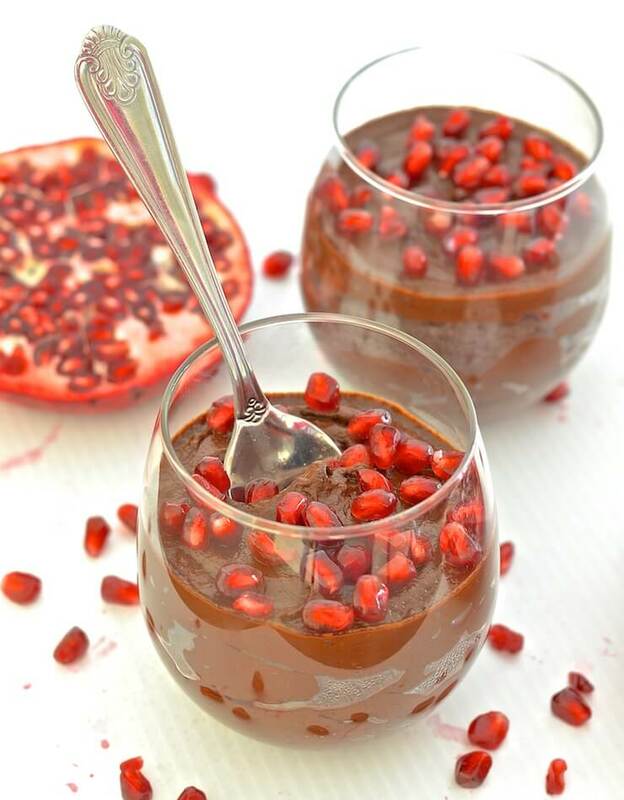 The good news is that this amazing Vegan Chocolate Pudding is healthy. The bad news?…..There is no bad news. It’s all good. Very good in fact. It’s all good because this pudding is hiding a dirty healthy secret. Actually two healthy secrets. One is sweet potato and the other is banana. You might recall that I used sweet potato in my Healthy Chocolate Smoothie. Well it worked so well that I just had to play around with it in pudding form. And by ‘play around’, I mean quite literally, throw everything in a blender. That’s about as complicated as it gets. 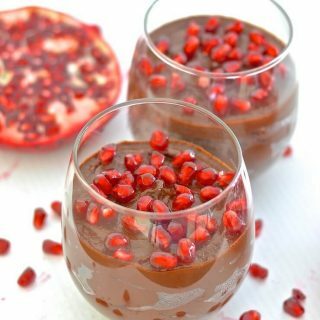 As well as being super quick and easy to make, every-time you eat this Healthy Vegan Chocolate Pudding, you are actually eating fruit and vegetables. It really doesn’t taste ‘healthy’ though. It is rich, indulgent and super chocolatey. You cannot detect the sweet potato at all. It serves to sweeten, thicken and make very, very velvety smooth. The banana comes through, but banana and chocolate is a match made in heaven so there are no worries there. This pudding is a dream to eat. It is so luxuriously thick and intensely chocolatey. It will kick any chocolate cravings well into touch. Or just serve it as it is! It seems that the chocolate section of my recipe index is growing at a faster rate than any other. I do believe that I am a chocoholic, and today’s recipe is the latest instalment in my chocolate take over. I do hope you enjoy it! Be a ☆ and leave a comment below to let me know your thoughts, and it would be awesome if you could share a pic on Instagram. I am @avirtualvegan. If you use the hashtag #avirtualvegan it will make sure that I don’t miss them. Add all ingredients to a blender, starting with the liquid first. If you wish to stir through some chocolate chips do so now. Spoon into dessert bowls or glasses and refrigerate. Refrigerate for at least 1 hour for the best flavour/texture. The pudding continues to thicken as it sits in the fridge and is good for up to 4 days. I like this recipe a lot. It’s very simple and all the good stuff that you just don’t associate with chocolate pudding ;) I can see myself making this often from now on. Sneaky sneaky getting in those fruits & veggies – I like it! And I’m all over chocolate pudding. Yum! Ha ha! I like being sneaky. ???? Thank you Kimmy! I can’t believe there’s sweet potato in this! You can’t taste it. Yum! LOVE this!! Pudding is so good – I don’t eat it nearly enough. And this is a pudding I can feel good about eating – it’s so healthy! Great idea to use sweet potatoes! You always come up with such great healthy ingredients! Oh my gosh, this looks so good! And I love those pretty pomegranate seeds on top! Sweet potato totally works! It reminds me of Dreena’s famous chocolate cake. Looks so delicious! It’s so great with chocolate! I love this recipe’s “secret” ingredient! I would have never thought to use that in chocolate recipe. I like the idea of adding sweet potatoes and bananas to this dessert. 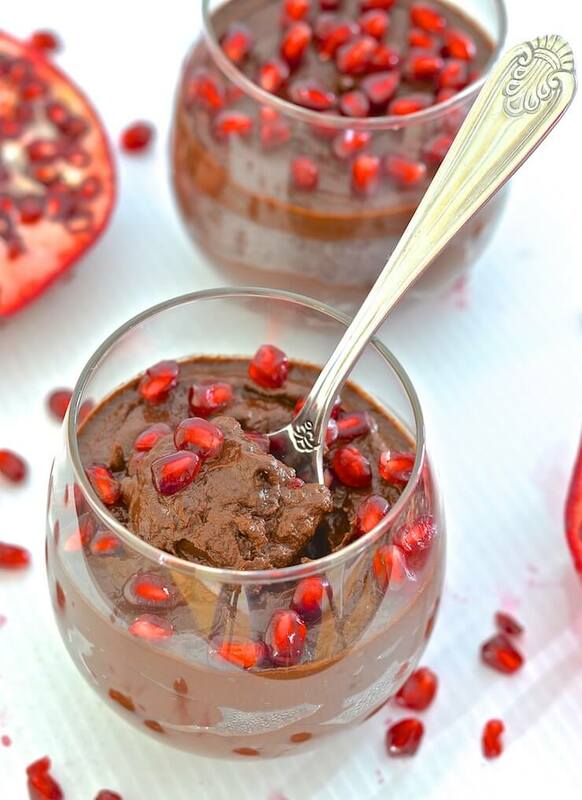 Topping the dessert with pomegranates finishes off the dessert perfectly. Thank you. The pop of colour from the pomegranate is lovely! Hello! Is there something I could sub for the banana? Bananas tend to hurt my stomach (even when brown and spotty ripe). I’ve tried avo pudding and chiaseed, am interested in the idea of using a sweet potato! You could probably get away with using more sweet potato in it’s place. Just a bananas worth. About 1/3 of a cup I guess that would be. Hope that helps!